TORONTO, October 24, 2018 – Canada’s audit regulator has reported a jump in significant inspection findings of the Big Four public accounting firms in 2018. While overall quality remains strong, according to the Canadian Public Accountability Board, CPAB reports inconsistent audit quality overall and more than double the number of significant findings discovered in 2017. CPAB defines a significant finding as deficiencies in the application of generally accepted auditing standards that could result in a restatement of the company’s financials. CPAB reported significant findings in six files in 2017. The national regulator reports 14 significant findings of 77 audit engagement files by Deloitte LLP, Ernst & Young LLP, KPMG LLP, and PwC LLP in 2018. One notable aspect of this year’s report is the absence of a separate section and historic graph of significant findings, which makes year-over-year comparisons difficult. The 2017 Big Four Inspections Report, released in November 2017, included a three-year comparison of significant findings, while the 2017 Annual Inspections Report included a six-year comparison. CPAB has responded, however, to the request of audit committees to release the fall report earlier in the audit cycle. CPAB Chief Executive Officer Carol Paradine, who took over from former CEO Brian Hunt at the beginning of the year, assured stakeholders that inconsistencies will be addressed. “As we examine these inspection findings, we are continuing to see inconsistent audit quality; while the overall state of public company auditing in this country is strong, this prolonged inconsistency is something we are focused on requiring the firms to resolve. 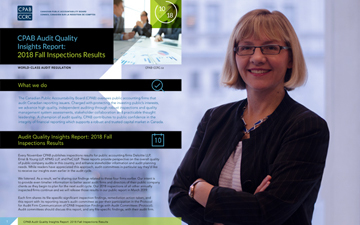 Canadian Public Accountability Board Chief Executive Officer Carol Paradine, CPA, CA. According to CPAB, the regulator revised its inspections approach in 2018, “to enhance its assessment of audit quality by increasing its focus on existing quality management systems to accelerate improvements at all four firms." The regulator has in the past expressed a desire to assist firms in developing quality controls across the entire audit cycle rather than focusing on inspection findings at the end. “Firm leadership and CPAB identified specific weaknesses and gaps across all firms’ quality management systems,” said Jane Williamson, senior vice-president, audit regulation. “Of note, in many cases our file-related significant findings were indicative of deficiencies in the firms’ quality management systems. Two firms demonstrated an acceptable level of audit quality, according to the report. (CPAB does not identify firms and their findings in their public reports.) Two firms with more findings than last year are responding to CPAB’s remediation requirements. Common findings related to business combinations, revenue recognition, impairment testing, and basic audit fundamentals. CPAB states no restatements have been required to date. CPAB specifically cites China as a country that does not provide access to audit work. While the regulator says it is making “good progress” with Canadian securities regulators to amend legislation to improve access, investors in companies such as Sino-Forest Corporation may consider the statement a warning. In a surprising statement, “CPAB is aware of approximately 50 Canadian reporting issuers that either hold crypto-assets or are contemplating crypto transactions,” which it calls a “growing new frontier for most of us.” News that Canadian public companies — most likely financial institutions — are holding cryptocurrency assets such as Bitcoin should find interest from stakeholders. CPAB reports that it is working with CPA Canada in the development of resources for auditors. Colin Ellis is the managing editor of Canadian Accountant. Click here to read the CPAB fall 2018 inspection report. 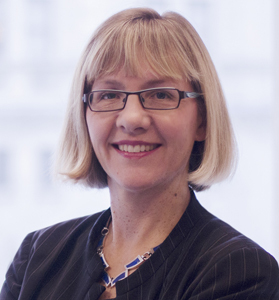 Pictured: Carol Paradine, CPA, CA, chief executive officer, Canadian Public Accountability Board.